GoTo Entertainment has a variety of slot machines. These are Casino games based on three or more spinning reels. The object of the game is to line up three or more of the most valuable symbols on these reels on what are called paylines. 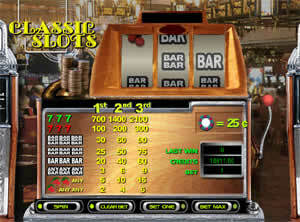 When this happens you will be paid out according to the Payout Schedule of the particular slot machine you are playing. Slot machines are the most diverse, colorful and varied of Casino games. The payouts can be huge.